With good reason the customer would like to have robust and long-lasting materials in his bathroom which should be easy and gentle to clean. Therefore it is important to already point out during the sales conversation the different characteristics of the individual sanitary materials and to give appropriate cleaning advice. As also done when buying an expensive leather couch for the living room. Surprisingly you very rarely find this kind of advice in the sanitary field although the various materials differ significantly. Today you can find many new materials and surfaces in the bathroom, for example acrylic, mineral cast or easy-to-clean coatings, this means that also the cleaning and care gets more demanding. A standard sanitary cleaner can harm an enamel bathtub and a conventional glass cleaner can affect the coating of your shower cubicle. The consumer is often overwhelmed with regard to cleaning and care and often not willing to read the fine print on each cleaner. Once the maintenance has gone wrong or the sanitary equipment has been damaged by carelessness the professional will be the first to hear if the cleaning has caused damage. Your expertise and your good advice are a crucial step for more client satisfaction and together with the appropriate product range provide for your long-term success. 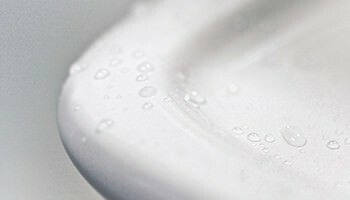 For your support we have compiled on the following pages the features as well as the repair and care recommendations of the most important sanitary surfaces. Please also note the obligatory care instructions of the individual manufacturers. Enamel (from the Old French esmal, meaning melted glass) is the result of a process whereby a raw material mixture of quartz, feldspar, soda, metal oxides, borax and potash are applied, usually to steel (and less commonly to cast iron), and melted at high temperatures. The glass-like coating which results is the enamel. Properties: Enamel is scratch-resistant, heat-resistant, very tough and easy to clean. Bacteria have no chance of flourishing on the pore-free surface. Thanks to the high heat conductivity of steel and enamel, an empty bathtub feels cool, but a full tub quickly takes on the temperature of the hot water. Note: Modern steel enamelled bath-tubs are relatively impact-resistant, but can still be damaged if struck by falling objects. Concentrated acidic cleaners can attack the enamel layer, causing the surface to dull. Cleaning and care: A cleaning agent not containing acid or sand, such as Cramer Email-Star, is ideal. Metal abrasions are most easily removed with the Bath-Rubber. Repair: Minor damage can be repaired with the Touch-up Stick from Cramer. More extensive impact damage calls for one of the Repair-Kits. Keramos is the Old Greek name for clay minerals and the products created by firing these materials. Today, sanitation ceramic is produced from clay, quartz, kaolin and feldspar and fired at high temperatures. In another firing process, the ceramic is given a thin, glass-like coating (glaze). Properties: glazed ceramic is very tough, heat-resistant and scratch-resistant. 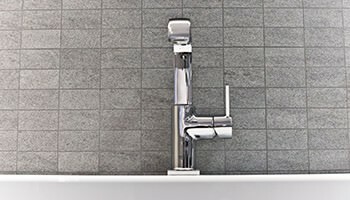 The smooth and easy-to-maintain surface is not sensitive to conventional cleaning agents and is ideal for use in bathrooms and WCs. Note: Hard falling objects can cause cracks and damage to the surface. Frequently used metal objects can also leave stains. These grey lines, which are very similar to cracks, can easily be removed with a special cleaner without attacking the glaze. Cleaning and care: Conventional bathroom or vinegar-based cleaners. For gentle, yet thorough cleaning, we recommend Email-Star. Metal abrasions are most easily removed with the Bath-Rubber. Repair: Minor damage can be repaired with the Touch-up Stick from Cramer; the Repair-Kit can be used for more extensive impact damage on sink rims. Unfortunately, stress and hairline cracks cannot be repaired. This term was derived from the Greek ákros (sharp) and hyle (matter) due to the pungent odour of acrylic acid. To create bathtubs, acrylic sheets are heated and then shaped using suction. After cooling, the back of the tub is reinforced with polyester and fibreglass cloth. Properties: The surface is easy to clean and resistant to most cleaning chemicals. Acrylic tubs are relatively impact-resistant. The thickness of the acrylic layer and the quality of the fibreglass reinforcement determine the tub‘s breaking strength. As a result of their low heat conductivity, acrylic tubs feel warm. Note: Hard falling objects can damage the surface. Cleaning agents containing sand will scratch and dull the surface. Acrylic is not resistant to concentrated decalcifiers, various solvents (e.g. acetone) and high heat. Cleaning and care: Acrylic should only be cleaned with soap, liquid non-scouring bathroom cleaners or the Cramer Acryl-Star and Acrylic-Cleaner special cleaners. Repair: Scratches can be removed with Acryl-Star; minor damage can be eliminated with the Touch-up Stick or the Repair-Kit. Unfortunately, stress and hairline cracks cannot be repaired with the Repair-Kit. Mineral cast composite is the technical term for a material comprised of mineral fillers, such as quartz sand or rock dust, and a binding agent (polyester or epoxy resin). The material is poured into moulds and then coated with a 1-2 mm thick colour coating made of polyester resin (gelcoat) after curing. Properties: Bathroom furnishings made of mineral cast composite have a pore-free surface and feel pleasantly warm when touched thanks to their low heat conductivity. They boast high loading strength, are relatively durable and are resistant to most common household cleaners and acetone. Note: Pointed falling objects can damage the surface. Mineral cast composites are more susceptible to scratching than ceramics and enamel and are not resistant to temperatures continuously over 65 °C (be cautious of excessively hot water entering mineral cast appliances). Chemicals such as hair dyes can discolour mineral cast sinks. Cleaning and care: Mineral cast composites should only be cleaned with a soft sponge/cloth and a sandfree liquid cleaner or our special Mineral-Star and Mineral-Cast-Cleaner. Repair: Fine scratches can be removed with Cramer Acryl-Star. The Touch-up Stick and Repair-Kit are of limited suitability, as colour deviations can occur under certain circumstances. 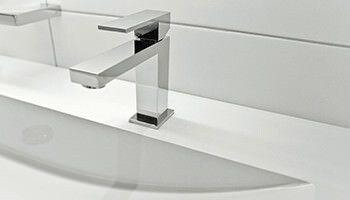 Different manufacturers offer their own repair solutions or factory customer service for high-value bathroom furnishings. 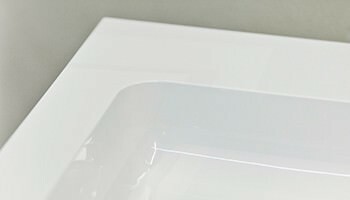 Solid surface materials include, among others, Corian® from DuPont or Hi-Macs® from LG. They are comprised of polyester or acrylic resin, natural minerals (e.g. quartz sand or aluminium hydroxide) and colour pigments. These components are mixed with a corresponding hardener and produced as moulded appliances. Properties: A solid surface material is a solid, homogeneous material which is coloured all the way through. The smooth, pore-free and anti-slip surface is easy to clean and feels warm thanks to its low heat conductivity. Fitted basins and counter tops can be adhered seamlessly. Gap-less installation means there are no edges under which dirt can collect. Note: high heat and pointed falling objects can dam- age the surface. Prolonged contact with concentrated chemicals and the use of drain cleaners should be avoided. Cleaning and care: Semi-matt surfaces can be cleaned abrasively (scouring powder or Cramer Email- Star). In the case of high-gloss surfaces, only mild, non-scouring cleaning agents or special cleaners, e.g. Cramer Acrylic-Cleaner and Mineral-Cast-Cleaner, may be used. Repair: The manufacturers of the appliances offer their own repair solutions and corresponding factory customer service. Chrome (from the Old Greek chrõma, meaning colour and relating to the beautiful colouration of the chromium compounds) is a silver-white metal obtained primarily from chromite ore. Metal parts are first plated in nickel in an electrolytic bath. The chrome bath which follows this step gives the parts their characteristic chrome coating. Properties: Chrome-plated surfaces are very durable. The metal coating is non-tarnishing and protects against corrosion. 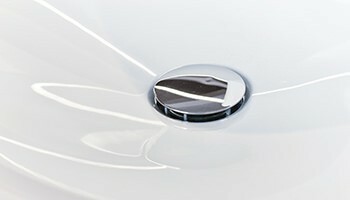 Chrome surfaces are usually high gloss, simple to clean and leave an impression of high quality. Note: Chrome is highly sensitive to certain chemicals. Cleaners containing acetic acid, hydrochloric acid, formic acid or chlorine bleach may not be used. Cleaners containing phosphoric acid may only be used under certain conditions. Scouring cleaning agents, microfibre cloths and pad sponges can also attack the chrome surface. 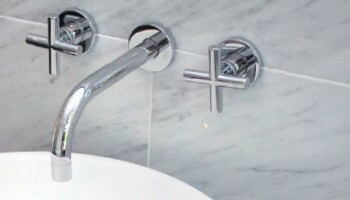 Cleaning and care: Chrome surfaces should only be cleaned with soap, mild bathroom cleaners and special cleaners, such as the Chrom-Star and Tap-Cleaner from Cramer, and approved microfibre cloths. Repair: In individual cases, a financially sensible renewal of the damaged chrome surface must be considered. Here, the old chrome layer is removed using electrolytic means and a new chrome coating is applied. Glass (from the Germanic glasa, meaning shiny) is the result of a process whereby a mixture of quartz sand, soda, potash, lime and other auxiliary materials is melted at high temperatures. The molten material solidifies into glass with different properties depending on the manufacturing process and the different additives used. Properties: Glass is a very hard, durable material which is simple to clean. Glass washbasins are usually made of float or melted glass, whereas single-pane safety glass with greater impact resistance is used for shower partitions. Note: Hard falling objects or rapid temperature changes when filling with water can lead to cracking and other damage. Single-pane safety glass is more susceptible to scratching than normal window glass, so abrasive or scouring cleaners and cleaning blades (glass planes) may not be used here. Cleaning and care: Glass surfaces should only be cleaned with neutral cleaning agents, special glass cleaners such as the Cramer Shower-Glass-Cleaner and Mirror Foam, denatured alcohol or soap. Repair: Broken glass cannot be repaired. With certain glass types, deeper scratches can be ground out and polished with special machines. At present, this procedure is only cost-effective for large, expensive glass surfaces, e.g. shop windows, glass façades etc. Natural stone in the bathroom is a peace of living geology. It is a natural material which varies considerably. Be it marble, granite, slate or any other rock – stone always only is sanded, therefore texture and colour are at all times given by nature. Properties: Marble is considered the epitome of beauty, granite as a guarantee of hardness. Natural stones are generally considered durable and resilient, however, incorrect maintenance can have a visibly negative impact. Note: Do not use scouring or acidic cleaners, nor heavily fat-dissolving or leaching products. The use of the wrong cleaner can cause irreversible damage especially on acid-sensitive limestone like e.g. marble. Avoid the washing of laundry as well as the dyeing of hair in natural stone objects because it may cause a permanent discolouration of the sanitary surface. Cleaning and care: We recommend ph-neutral cleaners. In case of specific problems please follow the advise of the manufacturer. Repair: Special putties help removing chippings. Colour matched with colour pastes and rock flour it can achieve good results. Old, scratched and mat natural stones can be worked with diamond grinding discs. This work should be carried out necessarily by a specialist. Easy-to-clean is a collective name for a variety of coatings which make the cleaning process considerably easier. This effect is achieved via microscopic and nanoscopic roughness, which makes coated surfaces hydrophobic (water-repellent) and oleophobic (oil-repellent). Properties: Water droplets only contact the textured surface at a few points, bead up due to surface tension and roll directly down the drain with the dirt particles. This „beading effect“ also leads to a considerable reduction in lime deposits. 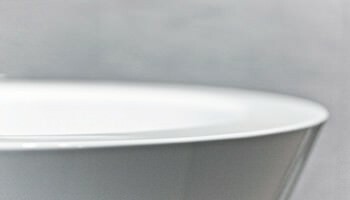 High-quality easy-to-clean coatings are usually applied during the manufacturing process and are characterised by a long service life and great effectiveness when cleaned properly. Note: Aggressive or scouring cleaning agents damage the easy-to-clean coating. 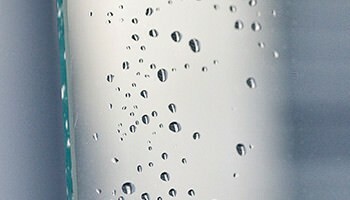 Cleaning and care: In case of heavy soiling, only mild and non-scouring cleaning agents or special cleaners, such as the Cramer Shower-Glass-Cleaner, should be used. Repair: Different manufacturers offer re-coating services for this purpose. Unfortunately, we are unable to provide information on quality or longevity here.